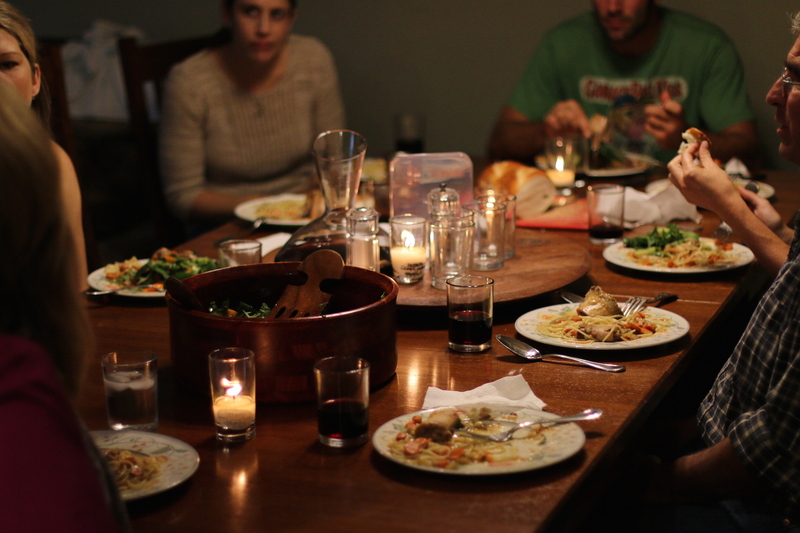 I love dinner parties. I love attending them and especially love hosting them. 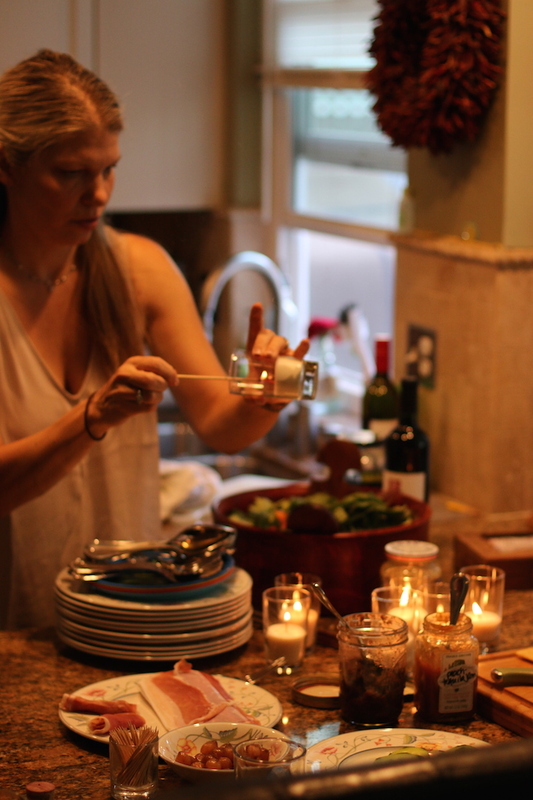 I think it’s fun to do something very dramatic as the main course when you can. 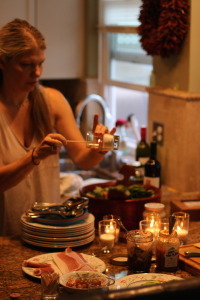 It shows thoughtfulness and respect for your guests and it just makes the evening extra special. 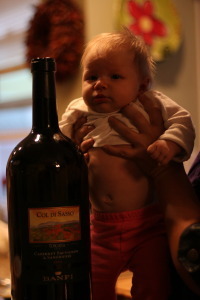 Big bottle of wine… a jereboam! 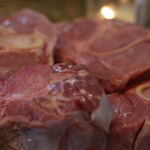 beef shank or a lamb shank as well and it would also be referred to as Osso Buco. When you talk about it in Italy though you’re talking about the veal. November always makes me think of this particular dinner because it’s one of my dad’s favorites and we’ve had it for Thanksgiving several times and my dad’s birthday happens to be in November as well. 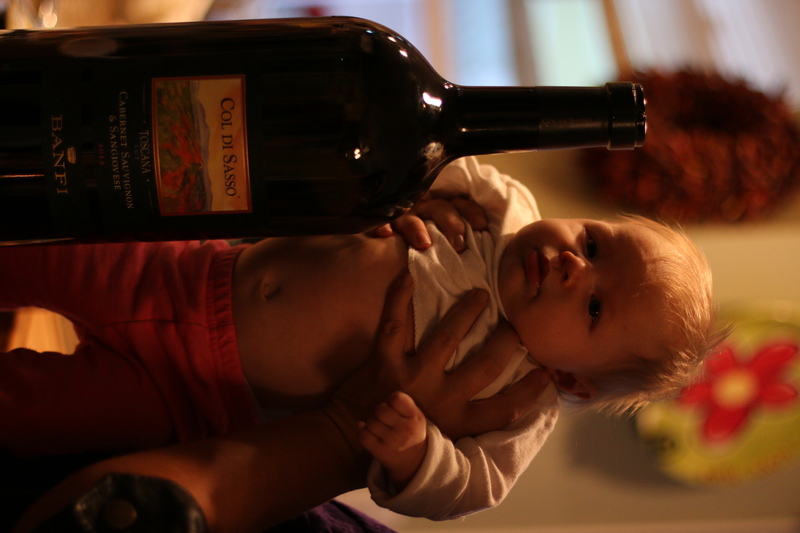 So when I hosted a dinner party recently I thought it would be really nice to make it for my friends out here in Los Angeles, as we were celebrating the opening of a giant bottle (A Jeroboam, which is 5 liters, or the equivalent of over 6 bottles of wine) of an Italian red wine that belonged to my friend Robert. 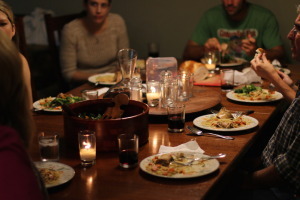 The dinner and the wine contributed to an evening to be remembered among friends… And isn’t that what you’re going for when you host a dinner party? What an opportunity to be intimate and have some social time with a small group of people that you really enjoy. This recipe was adapted from a version I found in the newspaper in the 80’s (I’m really sorry I can’t remember which newspaper, but it was something that was printed in the Northeast), and it was meant to be similar to a version that my parents used to get in Norwalk, CT at a restaurant that went out of business a long time ago called Ninetta and Dom’s. I’ve actually lived in Italy for quite some time, Florence to be specific, and the version that we got in Norwalk was by far my favorite. If it makes you feel any better both Ninetta and Dom were Italian. 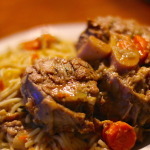 This Osso Buco is rich and it has lots of soft flavorful vegetables, fresh pasta, and meat that is falling off the bone. And the marrow from the bones is meant to be spread on buttered bread, and that is also very wonderful treat. 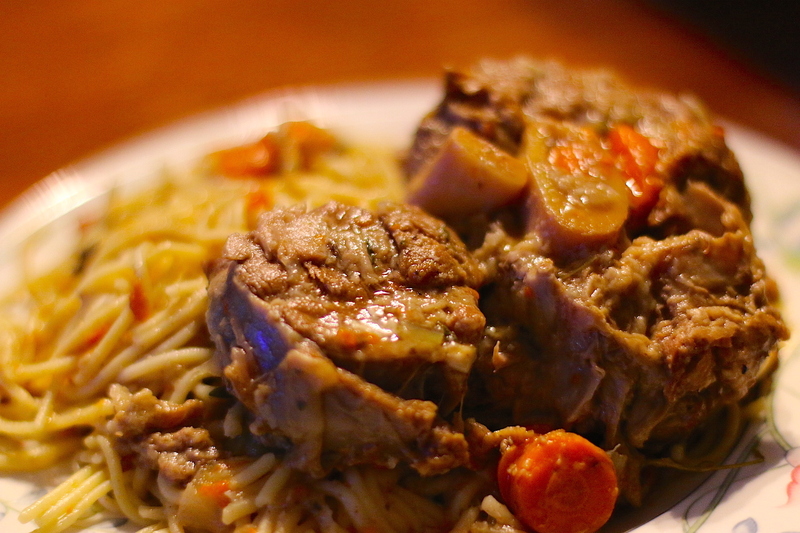 I should also note that it is no small task to find nice thick veal shanks in Los Angeles, which you definitely need for this recipe. The ones I used for my dinner party were terrific and they were from Marconda’s Meats in the LA Farmers Market (thank you Lou, for taking such good care of me). Preheat the oven to 350. Generously salt and pepper the shanks, dredge them in the flour and then brown them in a large Dutch oven on medium to medium-high heat in which you have melted the butter and olive oil. When they are golden brown on all sides, remove from the pot and set aside on a plate (you will put them back in later). 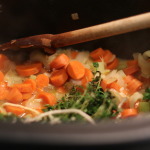 Put the onions, carrots and celery directly in the pot and cook until soft. If it seems a little dry, add a little splash more olive oil and a dab of butter. 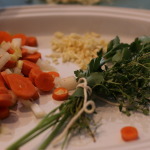 Once the opinions are soft, add the herb bouquet, wine and garlic and cook, scraping the brown yummy bits of the bottom of the pan with a wooden spoon, until the wine is mostly evaporated. 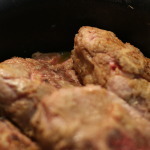 Put the veal back in the pot and also dump in any juices that have accumulated on the plate. Add the chicken stock, and cook in the oven (at 350) for 2 1/2 hours. When it’s done the meat will be tender and falling off the bone and the sauce will smell seriously divine. Actually the whole house will smell amazing. Serve over pasta, rice, bulgar, quinoa, or risotto and each person should get a shank and a couple of nice ladlefuls of the delectable sauce. Enjoy! Sounds wonderful. I’ll let you cook for me anytime. You always make wonderful dinners. Pretty high probability we’ll be having osso buco for Christmas since we didn’t get to it for your dad’s b’day this year … the best part is it can be made ahead and gets better! !